The PT-101UHD is a high-performance repeater/range extender for high quality Cinema 4K (@60Hz) HDMI 2.0 and HDCP 2.2 signals. The unit can extend the range up to 20m(66ft) for 4K@30Hz (4:4:4) and 4K@60Hz (4:2:0). Max. Data Rate - 17.82Gbps (5.94Gbps per data channel). 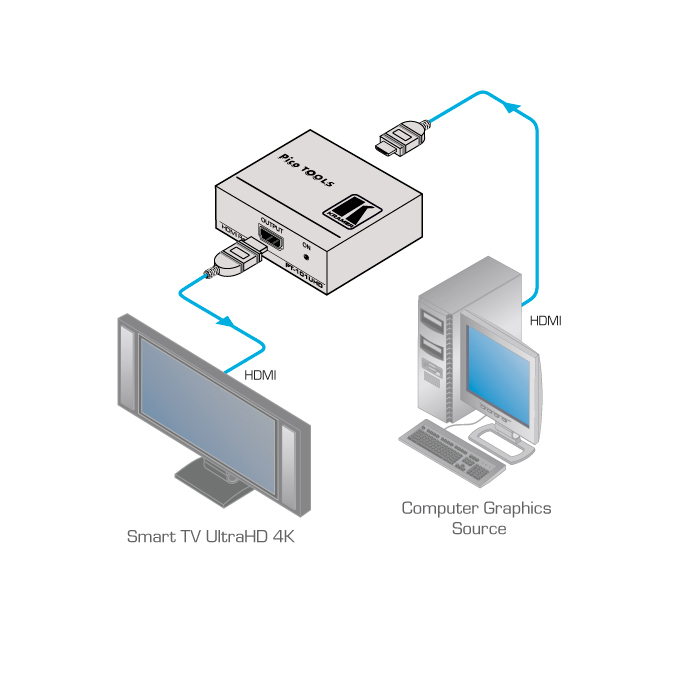 HDMI Output Power Follows Input - There is no power on the output when there is no active input. Size - Ultra-Compact Pico TOOLS - 4 units can be rack mounted side-by-side in a 1U rack space with the optional RK-4PT rack adapter. Input 1 HDMI on an HDMI connector. Output 1 HDMI on an HDMI connector. Bandwidth Supports up to 17.82Gbps (5.94Gbps per graphic channel); supports up to 4K @60Hz including WUXGA and 1080p 36-bit Deep Color. Warranty 7 years parts and labor.